This Gate Lock works with most of our Gate Openers. Also work with keypad for most of gates. Lock works on 24V DC power supply. This is a waterproof electromagnetic lock with exterior is made out of plated steel. Gate Lock works on 12 or 24V DC power supply. This Gate Lock works 12VDC and 24VDC power supply. For 24VDC system this comes with a Controller and it needs a 12V battery to boost up the current for 24VDC system. CISA Gate Lock works on 12VDC power supply. Made in Italy. Comes with manual release keys. This Gate Lock works 24VDC power supply. Comes with Manual Release Key. Works with swing gates. Z Bracket is used with our GLE2 and GLE21 Electric Locks. Most of the times Armature Plate of the lock mounts to the Z bracket and to the gate. GLE3 Electric Lock Mounting Plate can be used with most of Aluminium or Timber Gates. Plate is made out of aluminium and powder coated in black color. GLE7 Electric Lock Mounting Plate can be used with most of Aluminium or Timber Gates. Plate is made out of aluminium and powder coated in black color. 230V AC to 12V DC step down transformer with built in rectifier. Fitted with back up battery. 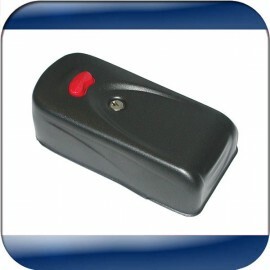 Use with electric gate locks and access controllers as power supply.